the Keitai Goddess : Hooping bliss! 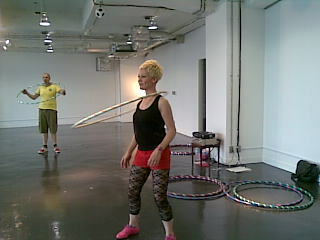 Deanne teaching us how to hoop! Am a bit of a spaz but am sure by the end of the class I will have it! You are a hot hooping babe! I got a feeling you have plenty more of those spin and jump through style tricks up your sleeve - I expect to see them tomorrow! I so wanted to go to this!!! Damn!!! I am inspired to go find a hoop at the local jugging goods store tho! That looks like fun. I have horrible memories of hula hoops in my childhood, but maybe my hips sway a bit better now. It was awesome - am totally knackered though - such a good workout. J-ster, try the links on this site as the hoops are from Sydney.